This is a draft article (or section) and is a work-in-progress. Please help us and our readers by clicking the edit link above and expanding/improving its text. 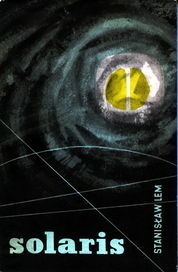 Solaris is the most famous of Lem's novels. It has been reviewed many times in various countries and languages. It belongs – probably as no other Polish literary work – to the core of its genre, to the canon: this novel about contact with aliens cannot be omitted in discussions of world science fiction. Why has „Solaris” achieved this status? Probably because the book not only presents the most original vision of the alien world known to science fiction, but in the most interesting and emotional way presents the drama of cognition and its entanglement in literature, in telling stories that is so inseparable from human culture. Along with Eden, The Invincible and Fiasco, Solaris is considered a part of the "quadrilogy" dealing with the impossibility of inter-species contact. It has been adapted into two feature movies, and translated to tens of languages. Unspecified future. A remote planet of Solaris has been discovered by humankind few dozens years ago, and has been subject to extensive research ever since. This is due to the fact, that the planet is entirely covered with ocean, which is very different from any known water reservuar. For example, it has the ability to create large solid structures, that emerge from it with no apparent reason, subsequently dissapearing without a trace. Thus, majority of Earth's scientists believe, that the Ocean is, or could be interpreted as, an intelligent lifeform. To facilitate the research over Solarian Ocean, a space station has been placed on platet's low orbit, as an outpost for numerous scientific expeditions from Earth. However, over the decades, despite the immense growth of solaristics and tons of articles and books written, full understanding of planet's phenomenon remains out of reach. Thus, interest in the space station and Solaris itself starts to diminish, even though the number of oddities and wonders caused by the Ocean awaits unexplained. For example, a classified report by pilot Berton, who, on a routine flight over the Ocean, witnesses a bizzare set of Ocean-created tructures. Earth sends one last scientist, psychologist Kris Kelvin, on a nearly deserted space station, inhabited now only by three remaining researchers: Snaut, Sartorius and Gibarian. Kelvin's mission is to assess crew's ability to continue the research, thus enabling any decisions of station's fate. The plot begins with Kelvin arriving on the station, only to confront that crewmembers are frightened of him for unknonwn reason, and some of them cannot be found. As the plot unravels, Kelvin experiences the selfsame phantasmagoria his crewmates do, only to confront the unkown the Ocean is, and, as a representative of entire humankind, face the impotence of contact. This page was last edited on 6 July 2011, at 16:44.